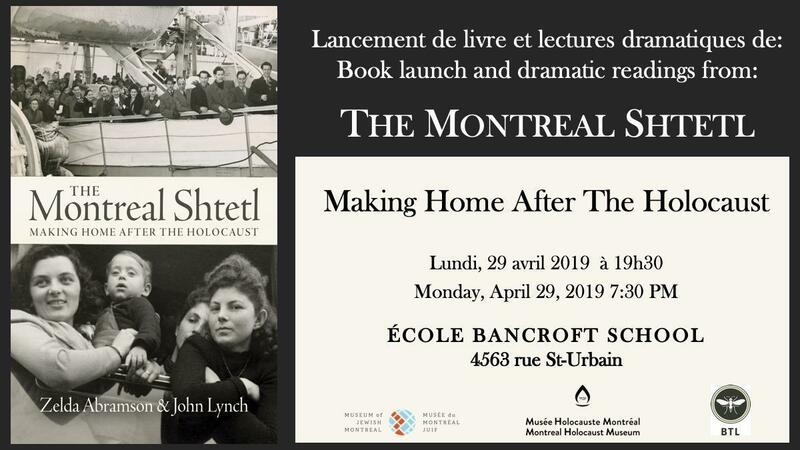 Please join us for the Montreal book launch of The Montreal Shtetl: Making Home After the Holocaust on Monday April 29, 7:30PM at École Bancroft School, 4563 rue St-Urbain. We have invited community members to perform dramatic readings from the narratives in the book. The Montreal Shtetl: Making Home After the Holocaust (Between The Lines Press) by Zelda Abramson and John Lynch is a story of displacement, migration and resettlement. It portrays the daily struggles of Holocaust survivors who settled in Montreal post World War II. Narrated through the voices of Holocaust survivors, the stories depict the difficulties encountered with housing, work, language, culture, and a Jewish community that was not always welcoming. The Montreal Shtetl presents a history of Montreal’s post-war Jewish community and of a city in cultural, economic, and political transition. Please use the NORTH entrance at Bancroft. (There are five stairs to climb to enter the school. Assistance, if needed, will be available.) There is parking at the north and south ends of the School.